As Plato once said, “Let food be thy medicine.” Could the Greek philosopher’s sage advice have an application for the dreaded holiday hangover? We know the right kind of sustenance truly can improve one’s hungover nausea. 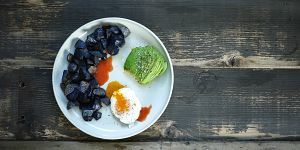 If you’re suffering the unfavourable symptoms of a fun and frivolous night out, try one of these ten dishes which have Plato’s guarantee to stop the spins and put your unsettled tummy to rest. Are you hungover with no Advil in sight? Do NOT run to the store…just poach a pair of free-range eggs (whose bright orange yolks are so much more delicious than the less humane variety), toast some good toast (pictured above is Small Victory‘s spelt bread) and smash your ripe avocado. For best results, sprinkle with salt, pepper and maybe even a little (or a lot!) of Frank’s Red Hot. Because you should treat hangover breakfasts the way your mom treated sick-day breakfasts: simple…yet delicious. 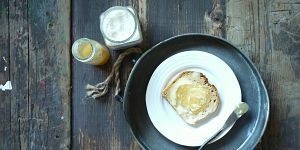 Go heavy on the butter (I use Earth Balance Spread) and honey because we all know calories do not count the day after a night of drinking. 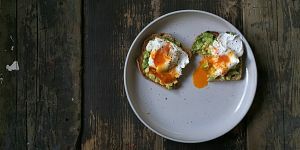 Though greasy food is actually better at preventing a hangover than curing one, an heavy breakfast really is the only thing your stomach wants the morning after. Start by boiling bite-sized potato wedges (I love fingerlings from SPUD) for five minutes, fry them until crispy golden in a pan with your choice of oil (I use avocado, coconut or grapeseed oil), then sprinkle with lots of S&P. On another element, barely poach an egg. You want your yolk to be more of a sauce than anything else. Serve with homemade ketchup or Honey Bunny’s organic version that’s sweetened with honey. Doesn’t this sound SO comforting? Plus, it’ll warm your tummy and neutralize acids in your stomach. Make your usual oatmeal on a stovetop using almond milk instead of water (to maximize richness and deliciousness) then add a sliced banana or two and cook until all those delicious fruit sugars have flourished. Garnish with a few glugs of maple syrup, a handful of fresh pecans and your milk of choice. The best. Right? A big, sloppy, easy-to-make (even if you’re still a bit tipsy), ultra-tasty fry-up…with cheese (I love Daiya) and Sour Cream (try Tofutti). Start by heating oil in a pan, then add garlic and onions until they’re soft (5 min). Then add a can of black beans, a big squeeze of fresh lime, a big pinch of smoked chili spice and S&P. Chuck in a container of grape tomatoes, a cup of organic corn and then finally, a coupla eggs. Garnish with salsa, avocado, cheese and sour cream. Because sometimes we are so hungover, we don’t even feel like getting off the couch to make the simplest item on this list. Even though it is so easy to make. We are that hungover. And nothing is easier than cold leftover pizza (or pasta), because you don’t even have to microwave it. Isn’t it better cold? Maybe we just tell ourselves that so we don’t have to take that extra step of heating it. 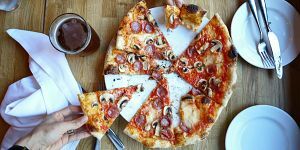 Here’s a list of my favourite pizza joints in Vancouver or make your own (try this recipe from Smitten Kitchen, whose recipes we can always trust). Adding ketchup, mayo and mustard together, in copious amounts, onto this burger bun is such a must…as is a soft, easy-to-bite-into, toasted bun (read this post to discover which big local supermarket makes the perfect burger bun according to burger master Chef Rob Belcham). 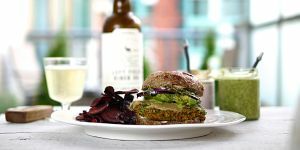 Pictured is a Moroccan Yam Veggie Burger (recipe here…which you would obviously would have made last night, as you’re clearly in no shape to whip these up right now, you hungover person, you), or try Vega’s Black Bean Burger. 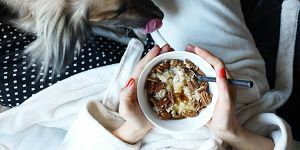 Years ago at a Cornucopia’s Nourish Series, Holistic Nutritionist Merina Koly shared her “hangover cure” recipe and it stuck to my brain like glue…because it works. And fortunately, it’s very simple. You just need the right ingredients: coconut water (the good kind) and organic spirulina or chlorella. Sourcing the right brands is important since most coconut waters sold at regular grocery stores aren’t the real deal. Head to a nice supermarket like Choices or Whole Foods and search for their young coconut water in the freezer section. You won’t believe how different it tastes than the $3 canned version that’s sold everywhere. 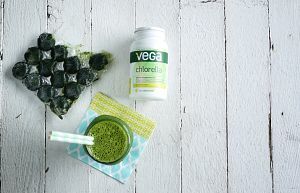 As for chlorella or spirulina (which you simply stir into the coconut water), try Vega’s or head to Sweet Cherubim (on Commercial Drive) for a selection of trusted brands. I also enjoy the above pictured wheatgrass shots (thrown into smoothies) from local company Swheatgrass.